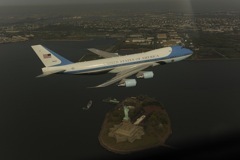 It was big news when the White House, without telling the public, sent Air Force One and a squadron of fighter aircraft to fly over New York City at low altitude. Many folks screamed to the high heavens that it was too soon after 9/11 to do it, and many others still called 911 suggesting another attack was underway. Today, we hear that the White House has fired the head of the White House Military Office, Louis Caldera, who authorized and oversaw the photoshoot. A second photoshoot was planned over DC, but scrapped after the furor.